I'm addicted to new projects - I was going to start another one! 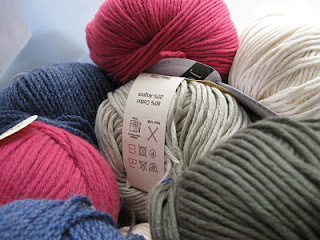 So, I dived into my wool stash to hunt for the perfect yarn.... and guess what, to my suprise, there wasn't the 'right' yarn. BUT.... whilst I had my head down & bum up in the cupboard, I found 3 more hidden stashes! Question....Do I hide these from myself or does the evil fairy come in at night and do this? And then I found this paperbag. 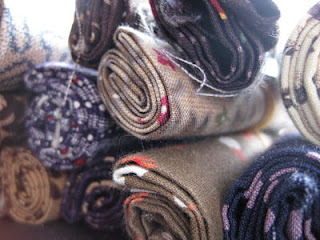 In it was a very cute stash of fabric squares, all rolled up. I remember buying them about 5 years ago, but why? Why did I buy them? What was I going to make? How did they end up in the cupboard hidden in a bagful of yarn? Then there was this bag.... another pile of yarn that I had bought with specific projects & patterns in mind. But they never got made! Suprise, suprise! I think the reason why they were never made was because of that P word, you know.... pattern. 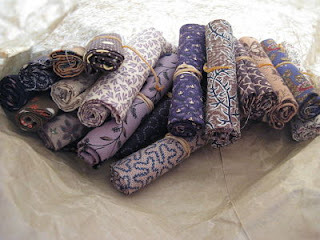 Me & patterns, ughh, I shudder at the thought! So back to why I was in the cupboard... 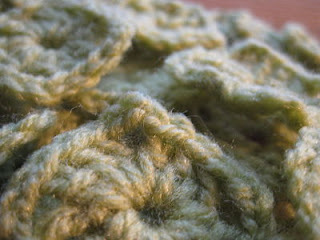 I found a cute 'pattern' for a crochet bag - it looks so easy, 4 triangles sewn together - easy peasy! But no yarn to make them. The bad news is that there is no yarn store near home or work - I would have to go out of my way to buy the yarn to start the new project. The good news is there is no yarn store near home or work - I would have to go out of my way to buy the yarn to start the new project!! Secret stashes uncovered. How exciting and inspiring. That bag looks great.